Finally, I feel like cooking again, although there isn’t much cooking involved here. But this was super delicious, nutritious, and easy to put together. And will probably be included in my Easy Recipes for Lazy Moms cookbook. 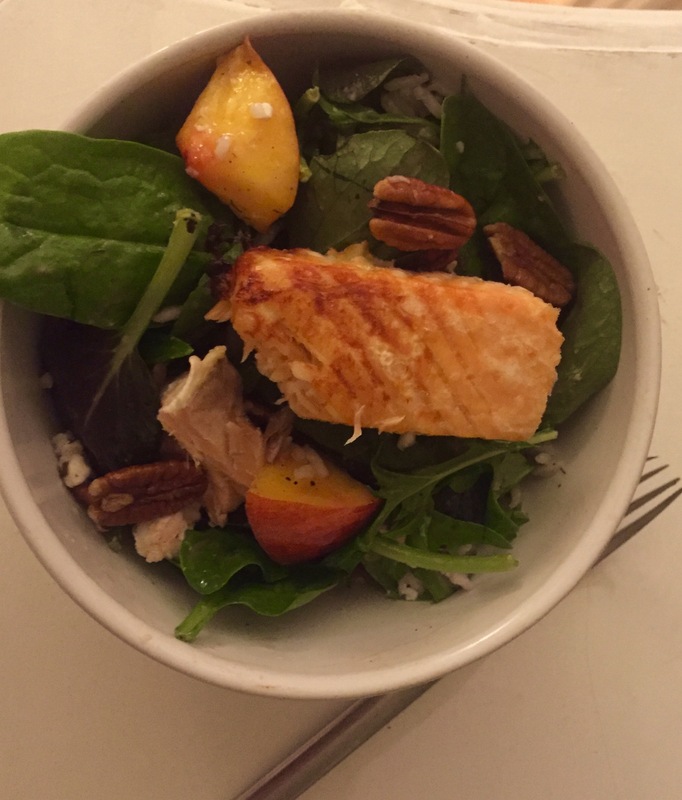 Nectarines and salmon go amazingly well together as do pecans and goat cheese. What you can’t see is that there is warm jasmine rice at the bottom of this bowl. I then layered a salad of nectarines, goat cheese and pecans tossed in a raspberry vinaigrette dressing. I cooked the salmon as per my good friend Jackie Novick’s instructions, in the oven at 400 degrees, with lemon and a tiny bit of butter for about 20 minutes. I made this for myself late one night and then took the entire thing upstairs, and sat in bed and read a book. Comfort food at it’s best.